So… I planted tomato seeds indoors in the third week of April. The next month or so was unseasonably cold, which might explain why my tomato seeds have germinated but have “failed to launch”, so to speak. 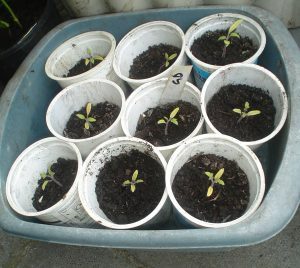 Now that the weather is a lot warmer I’ve potted them up and have put them outside. They can sink or swim – survival of the fittest. I’ve already bought a few tomato plants from a local bring and buy sale, and will probably buy more because I don’t think my own plants are going to go anywhere. Here they are… they are sad, to say the least.